Spring Dolly Varden From Talkeetna River Alaska on a Fly Rod! 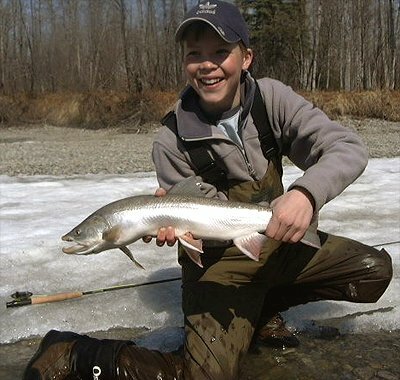 Cory is eleven years old and has been flyfishing Alaska streams for 4 years and fishing Alaska most of his life. This photo is of Cory with a catch and release spring Dolly Varden taken on the Talkeetna River in early May. He and his father flyfished with smolt patterns catching them on the drift, swing, hang down, and strip retrieve. Many Dollies were caught while wading, but also on the drift from the driftboat. This Dolly was taken on the drift with a home tied White Zonker, 9 foot leader, and Strike Indicator on a 9 foot 6 wt. St. Croix Avid fly rod with a Ross Gunnison reel.